All of our services are performed by us, on our premises. We send nothing out. Your clothes are picked up at your home or office and shuttled directly to our headquarters in Downtown Orlando, where all cleaning occurs, just as it has since 1928. Environmentally-friendly cleaning - At no-extra charge, green dry cleaning is performed by Acme for all our customers. 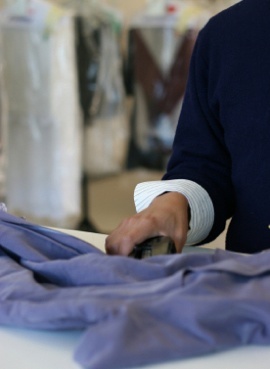 Couture cleaning - For higher-end or specialty clothing. We're endorsed by Neiman Marcus, St. John's and others. Garment care - Suits, shirts, pants, jackets, sweaters - premium cleaning at a not-so-premium price. Alterations - Our in-house tailor is here for our customers. Wedding dresses - We clean and preserve dozens of wedding dresses each month. Bedding - We deep clean and sterilize all bedding, and we'll do it for one great price. Sign up for home or office delivery now.